Time to celebrate all the wonderful women in your life - mom, friends, sisters, nieces, granddaughters, aunts - whomever. Spellbinders has a super easy way for you to let them know you care. 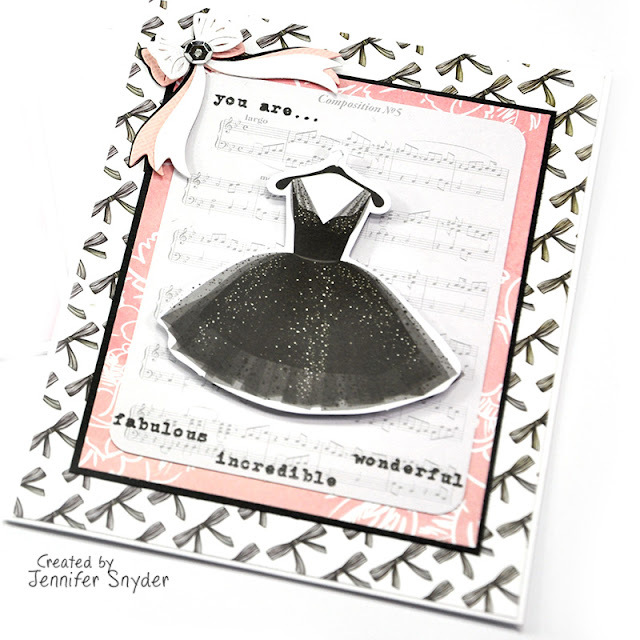 This month the Spellbinders Card Club Kit is jammed packed with beautiful diecuts, dimensional stickers, and delicate touches - amazing embellishments and paper we call the "Extras" . The cards in today's blog post were created using the "Extras". 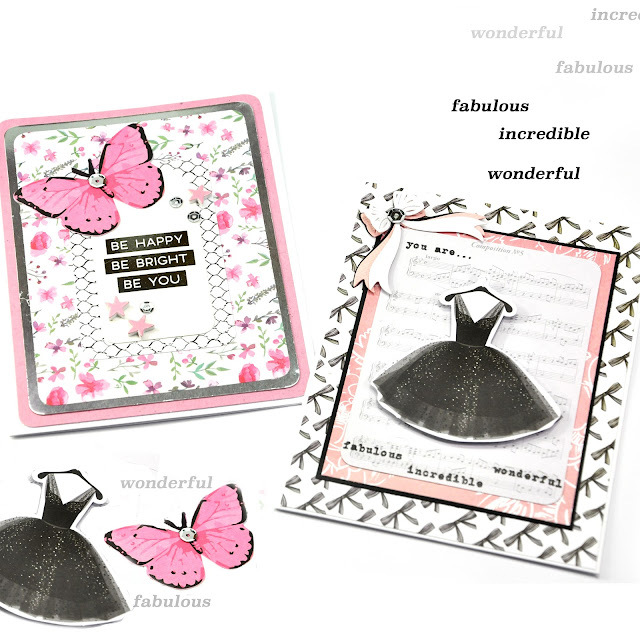 Here are the cards I created with the Extras for April: These feature the die cuts, puffy dimensional stickers and stamps. I've been asked several great questions regarding the Extras so let me provide some FAQ's on the Extras. 1. What do you mean by Extras? 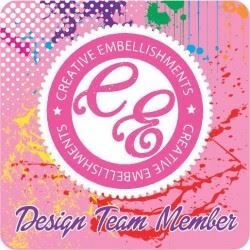 I'm going to swap out the word Extra and replace it with the word embellishments or products. 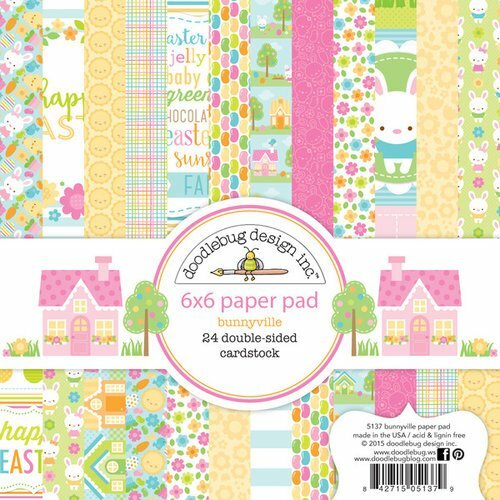 Each month Spellbinders selects some products in the kit that can be purchased separately if you run out and would like more...paper pads, stickers, die cuts. These would be extras. Think about it this way...if you used up your supplies and wanted to buy more, then you'll need Extras. 2. If I order the club kit, do I also need to purchase the Extras? The box will come packed with all the coordinating products for the month. Each box will have the die set, paper pad, and any accompanying embellishments available that month. You do not need to purchase anything else. Extras are optional and will be duplicates of products you already own. 3. Where can I purchase additional stickers and paper pads? 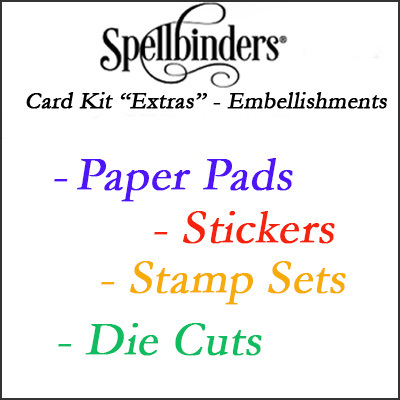 link: Spellbinders Card Kit Extras. 4. I do not have a Spellbinders Card Club membership. Can I still buy some of the beautiful Extras? Absolutely! 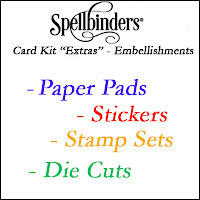 The products are offered for sale in the Spellbinders store while supplies last. Supplies are limited so hurry to grab your goodies. 5. Can I purchase last months kit? The supplies are limited and you can find all available club kits here: Past Club Kits - Limited Offer. Supplies are limited so hurry to grab your goodies. 6. Are the Extras the same each month? 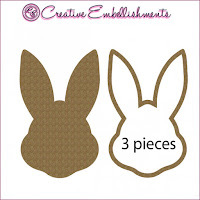 The supplies for sale individually (Extras) change each month just as the embellishments and products change. 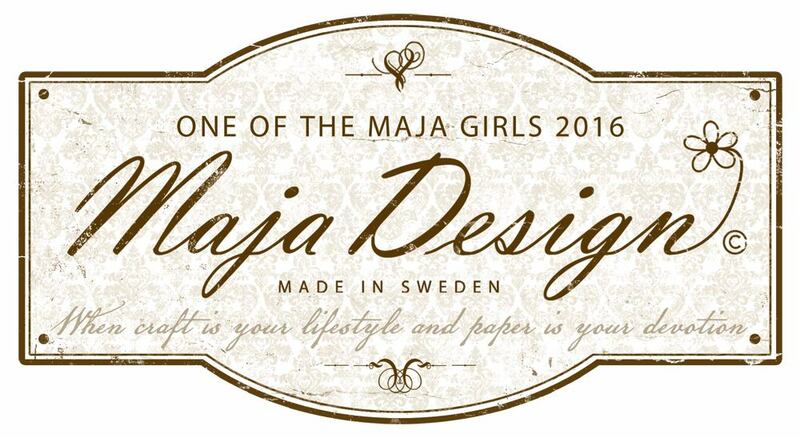 Stickers may be featured one month and die cuts offered the following month. Variety is what makes life fun and surprising. Happy Easter everyone. 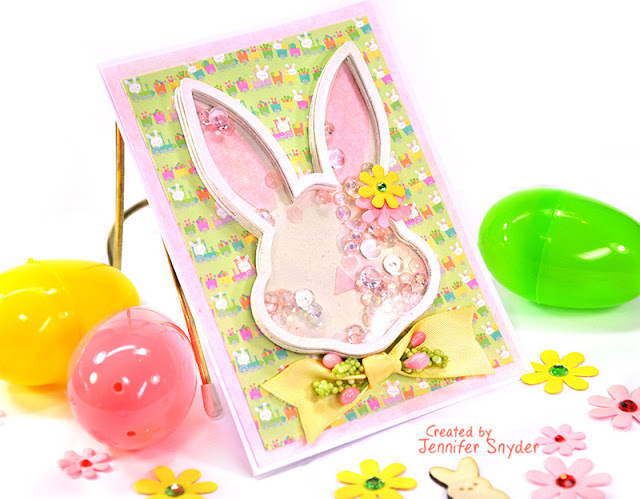 Jennifer Snyder here sharing my Easter shaker cards made with the new shaker chipboard sets from Creative Embellishments. 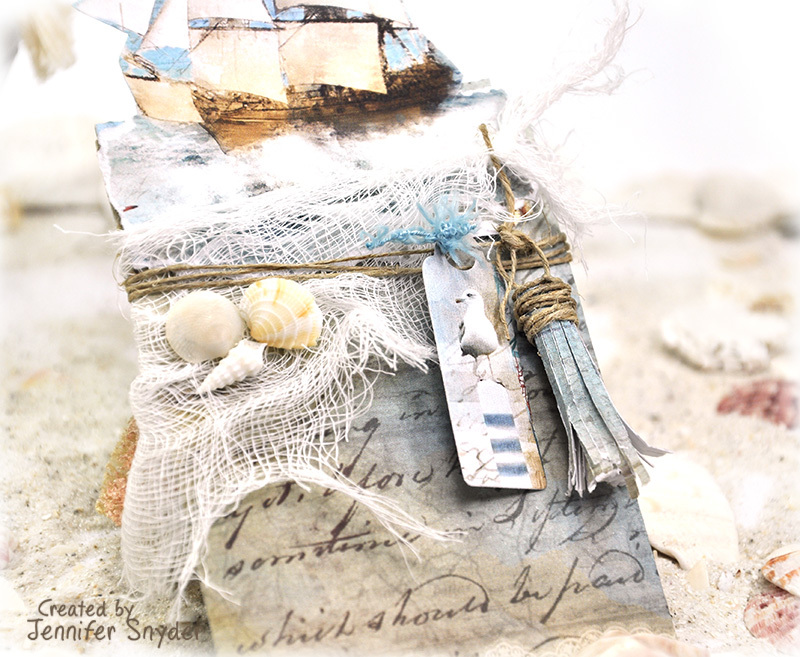 Do you love shaker cards? I must say I am absolutely obsessed with making them. They are always fun to make, fun to receive and create smile. 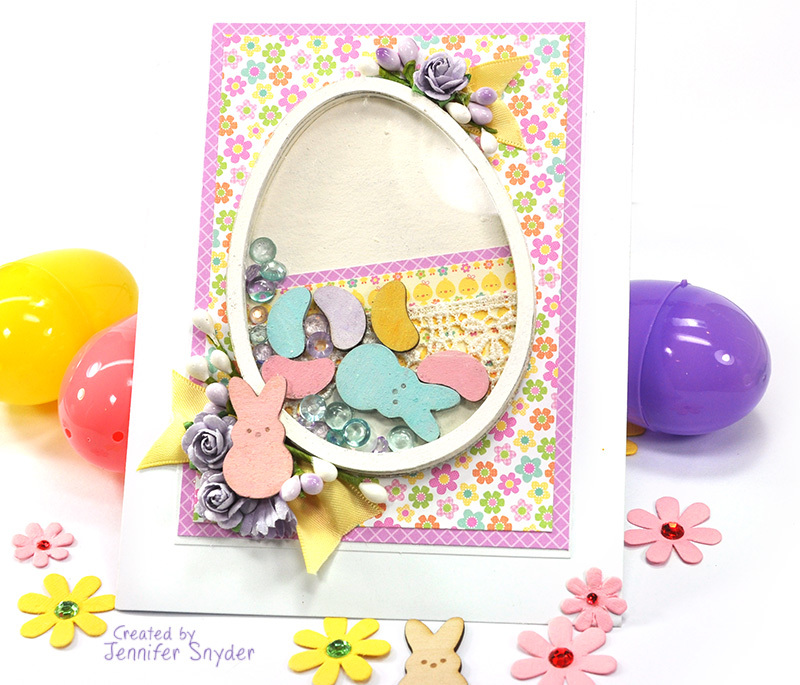 Nothing like knowing you are making a card that will bring joy to someone. 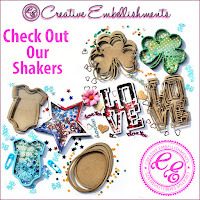 Creative Embellishments also has a fabulous variety of new shaker card designs. 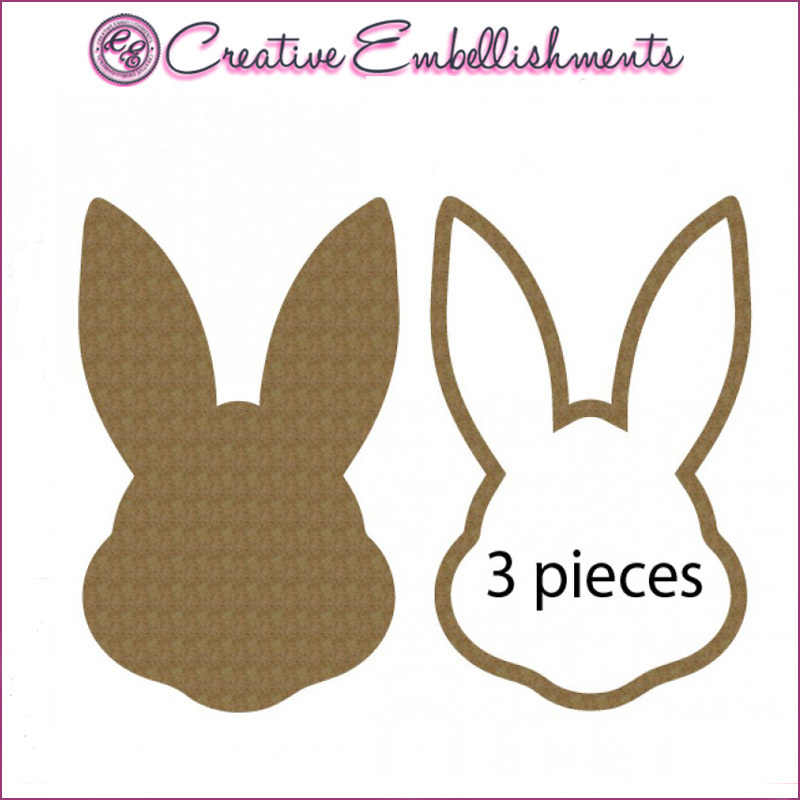 The sets come with a pre-cut and perfectly sized acrylic piece to cover the shaker. That's really important because the acrylic piece is the most critical and difficult part to create when making a shaker at home. I used the Bunny and the Egg shapes for my cards today. This is a close up of the bunny shaker card. 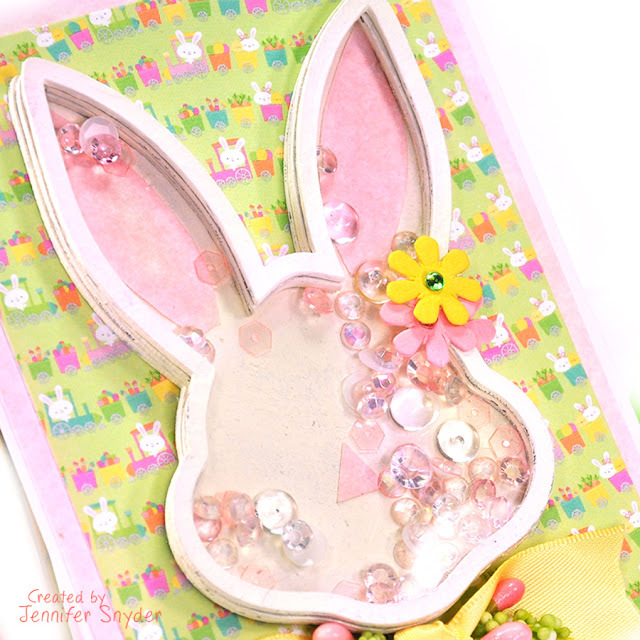 I painted all chipboard pieces with ivory acrylic paint, and added some pink cardstock for bunny ears and nose. 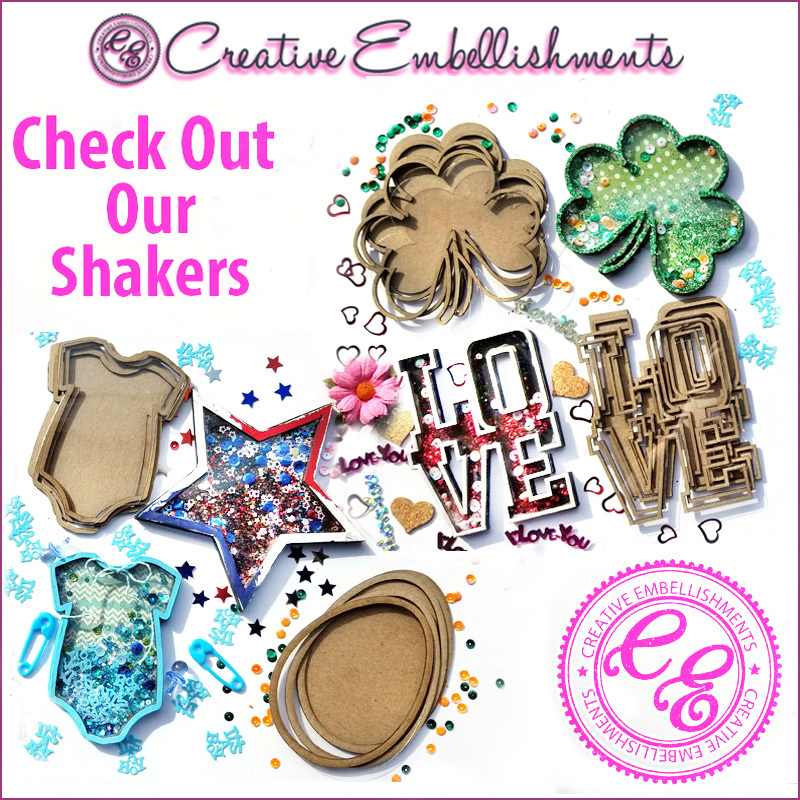 Wondering what to use for shaker filler? OK so now you have your shaker card made and you are ready to fill it. 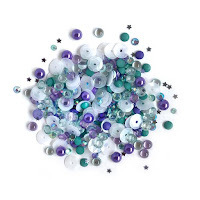 Don't sit at your crafty desk and look around for little bits. You have easy options! 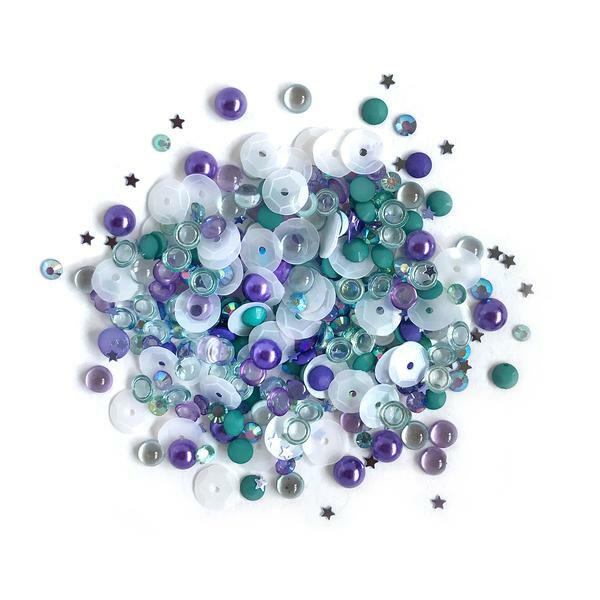 I filled with sequins and crystals from Buttons Galore - Sparkletz. 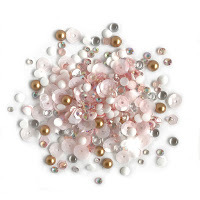 They have an assortment of colors and bits for the perfect filler. A second option is using wood veneer pieces from Creative Embellishments (I used these in the egg shaker card - keep scrolling down). TIP: Add your filler then use a good adhesive to seal the shaker with the pre-cut acrylic piece that comes in the kit. I used Beacons 3-in-1glue because it dries clear and works well with a variety of surfaces ( acrylics, plastics, wood, metal, fabric, canvas). The paper used on these cards is Doodlebug Design - Bunnyville 6x6 collection. 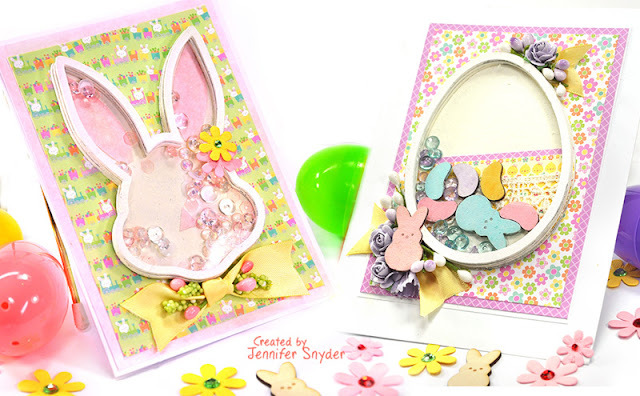 Totally adorable patterns for Easter. Here is the second card created. 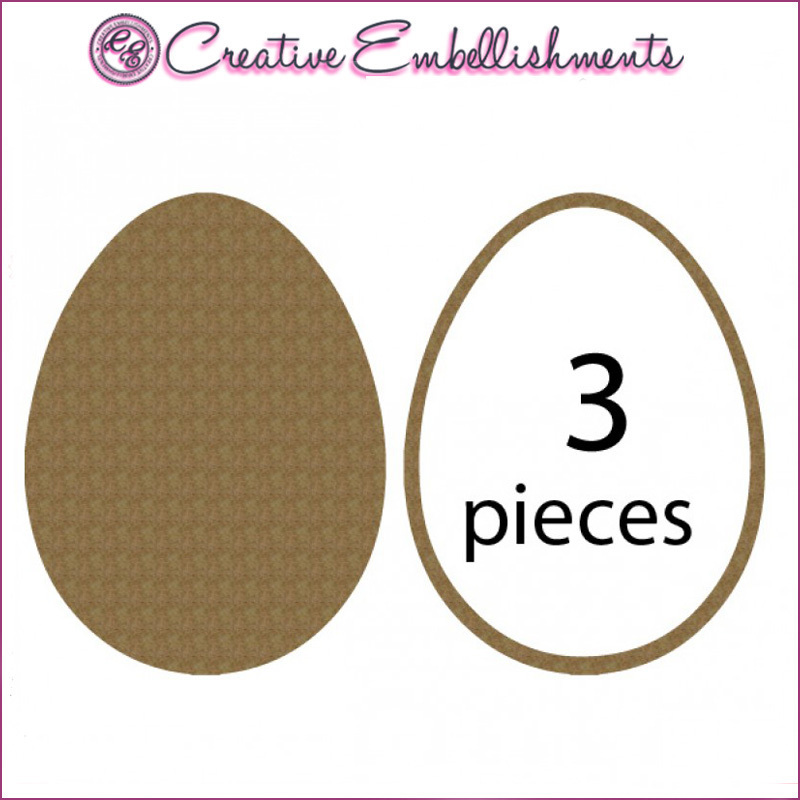 This is the traditional egg form painted with acrylic paints, then trimmed on the inside with lace and patterned paper for some egg-stra fancy embellishing. 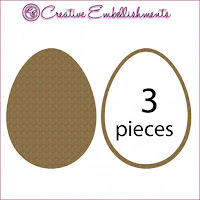 I filled the egg card with adorable wood veneer pieces from Creative Embellishments. 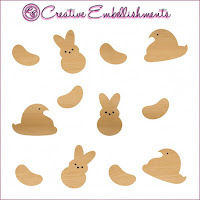 They are perfectly sized to use as shaker card filler. 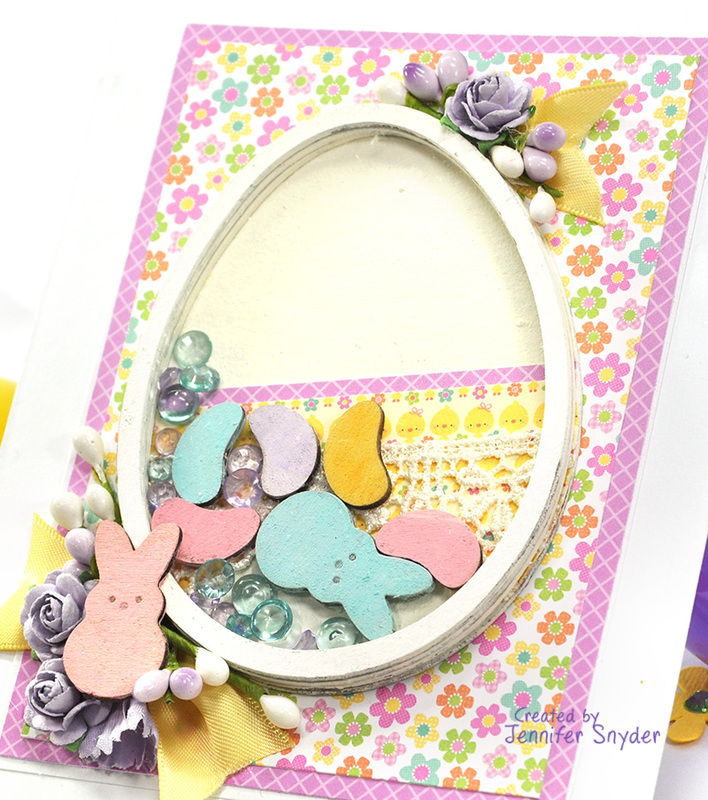 I simply painted with acrylic paints to look like traditional Easter candy - marshmallow peeps and jelly beans. Thanks for stopping here today. Happy Easter! 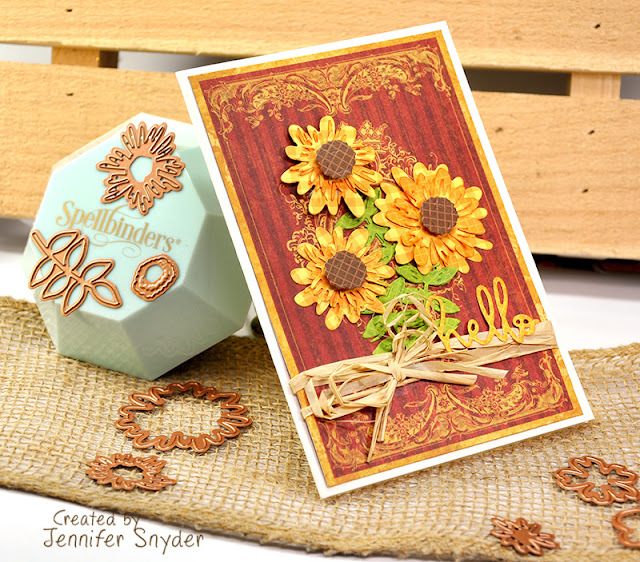 Leave it to Spellbinders to design a fabulous and practical die set that can be used as a card, tag set, and gift card holder. 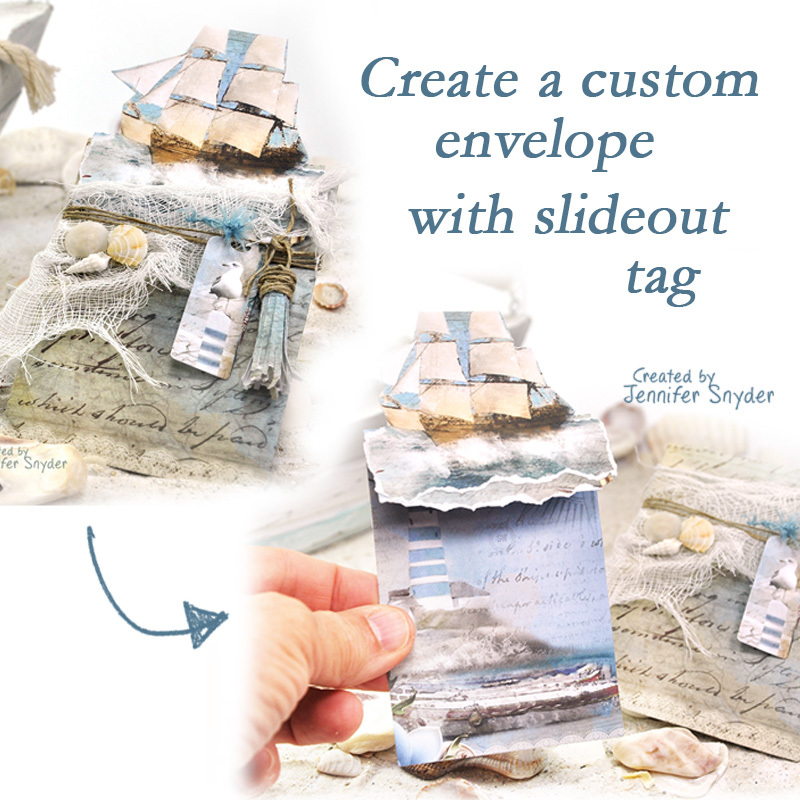 So many ways to use this - I chose to create a decorative envelop for a slide out card. 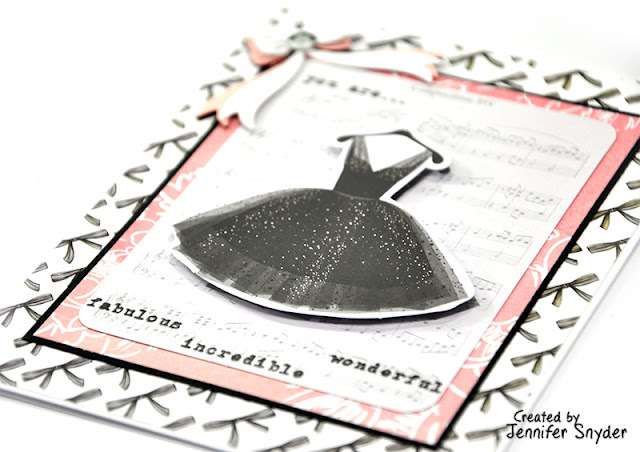 The envelope was gussied up with the embellishment dies from the set - the gift tag die and the fringe die. Here is a photo of the die set. Don't let the image of the die confuse you. Once you see the die in use, you'll smile and realize this is easy, useful for so many occasions and very very cool. Here is a helpful video produced by Spellbinders to show you how to use the die. Here is the video I created to show you what my project looks like. It's so hard to see and appreciate in photos. 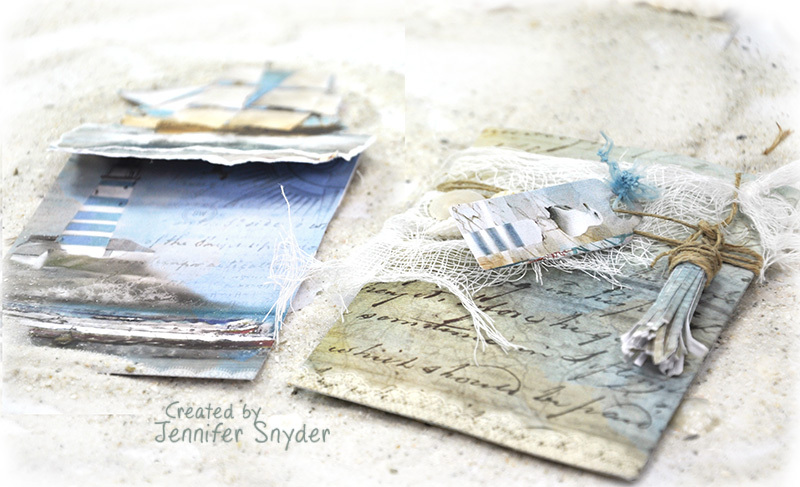 This is an image of the tag and envelope separated. I opted to use the ship as the flip top of the card. You can also see the tassel looks worn from years of sun, wind and salt water. 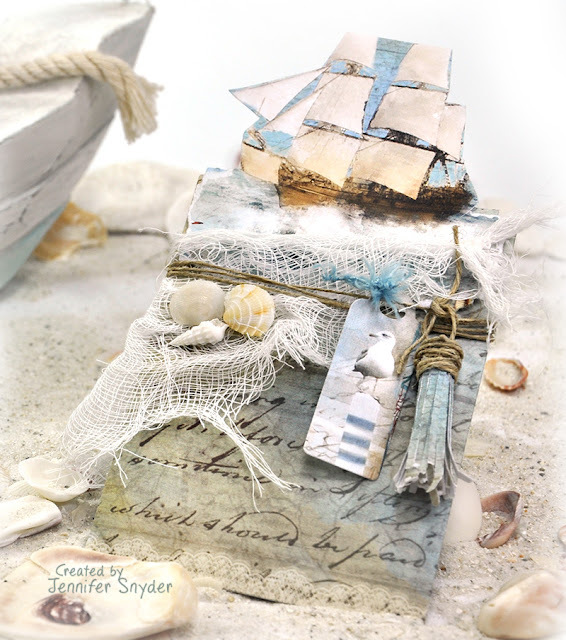 The hemp cord and cheesecloth are extra seaworthy touches. My paper choice for this project is from Craft Box UK - Seaside Stories. 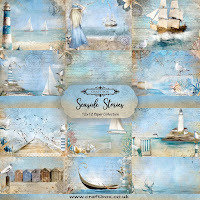 It's a soft, flowing, peaceful collection perfect for the vision of my card set. 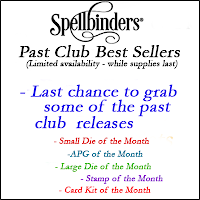 Time to seriously consider Spellbinders Clubs if you aren't already a member. You can find information on the various club selections and inspiration gallery here. Do you love sunflowers? I have always loved the majestic look of the sunflower. 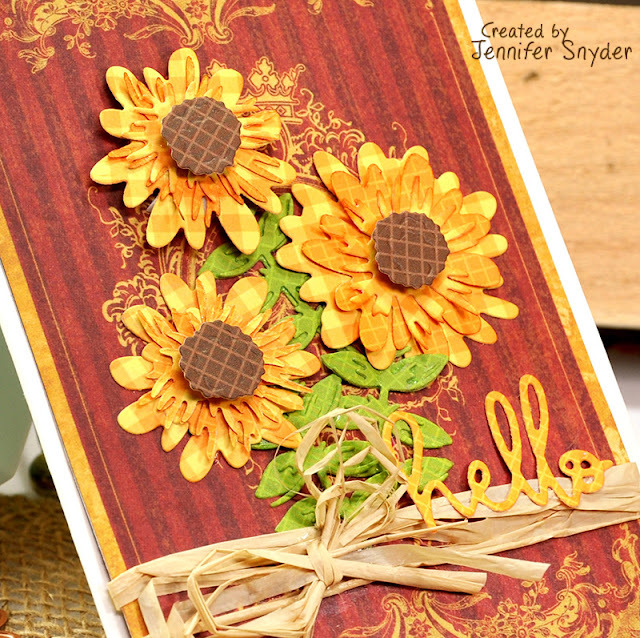 It's fun for me to think of ways to create sunflower designs. The Spellbinders Small Die of the Month for April was perfect for creating a sunflower field on a card. 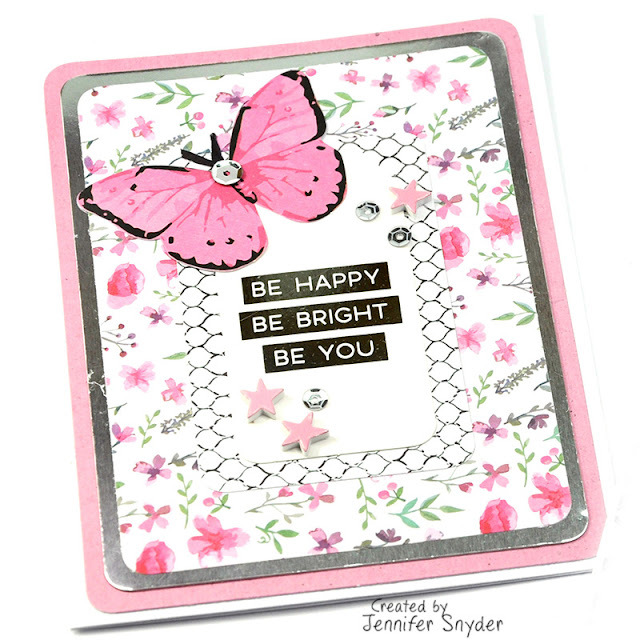 Below is a photo of the exclusive die set from Spellbinders. and the wonderful....Hello I'm thinking of you. This original die set is only available through the club. It's designed to give the crafter a variety of die cutting options - exactly what crafters need and want....options. And versatility. Lately I've been showing the coolest tool that keeps the small dies on my desk from sneaking away. It's Spellbinders Main Attraction Tool. 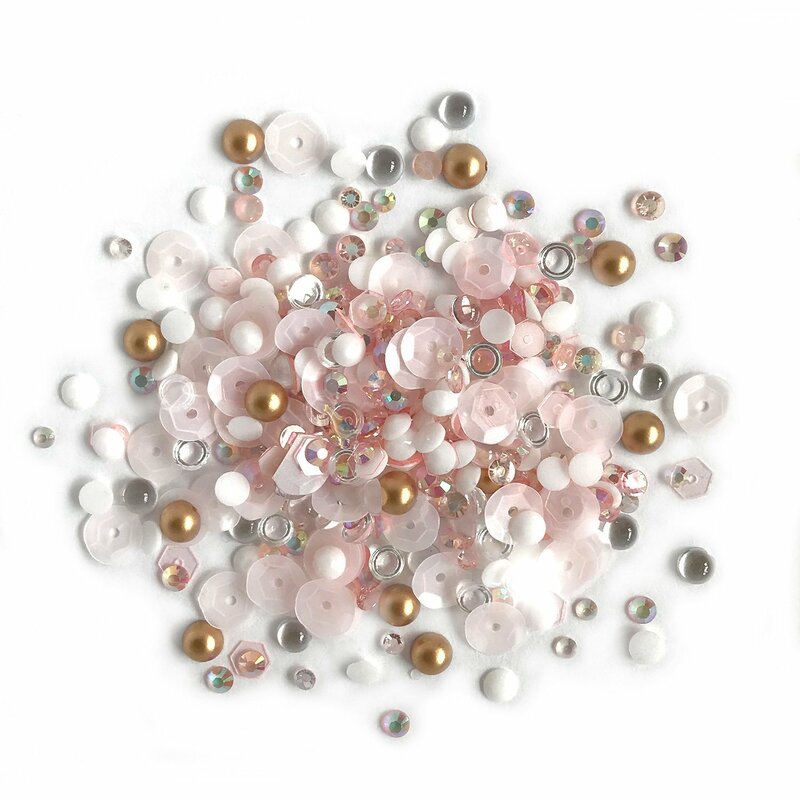 Made specifically for keeping those tiny dies on your craft table and in plain sight. I've learned from experience that crafters do not like playing hide-and-seek with supplies. I won't lie. The Small Die of the Month has a number of small die bits. BUT alas they are all safe on Spellbinders Main Attraction Tool. 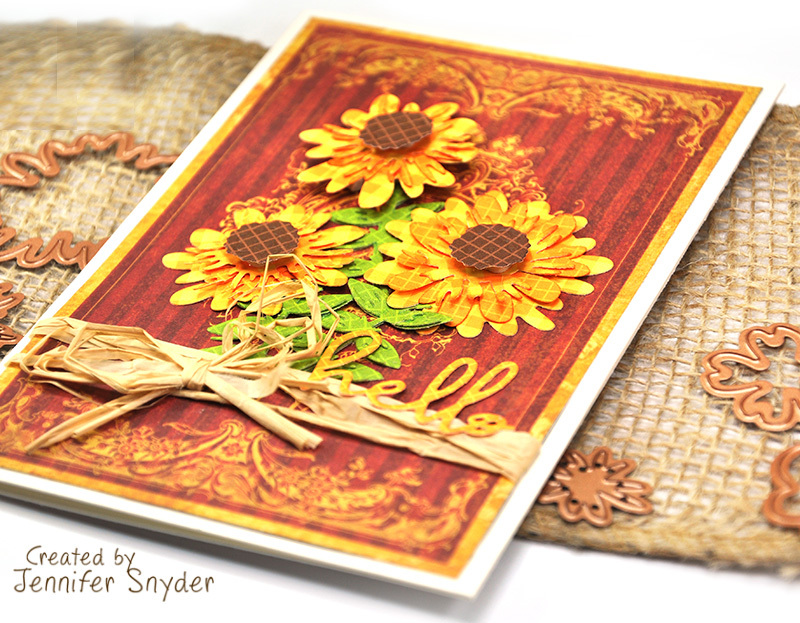 The papers I selected for this card are from the Graphic 45 - French Country Collection. Thanks for stopping here. Give someone the gift of handmade flowers today. 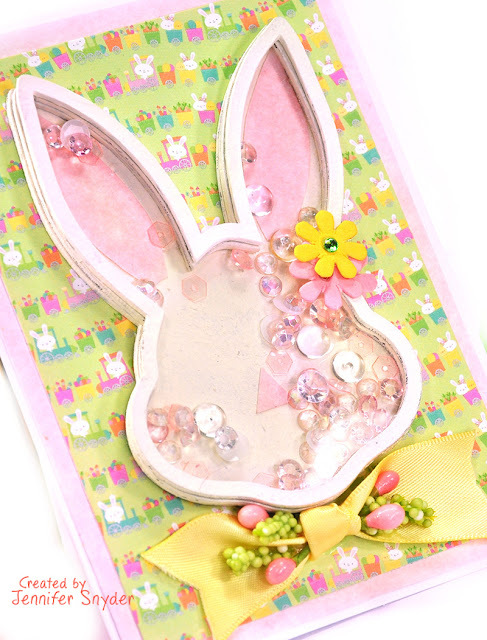 See all the Spellbinders Monthly Clubs Here.